Drop anchor in El Gouna, where two marinas and a pristine harbor town offer seafarers the Red Sea’s best in service, comfort and style. 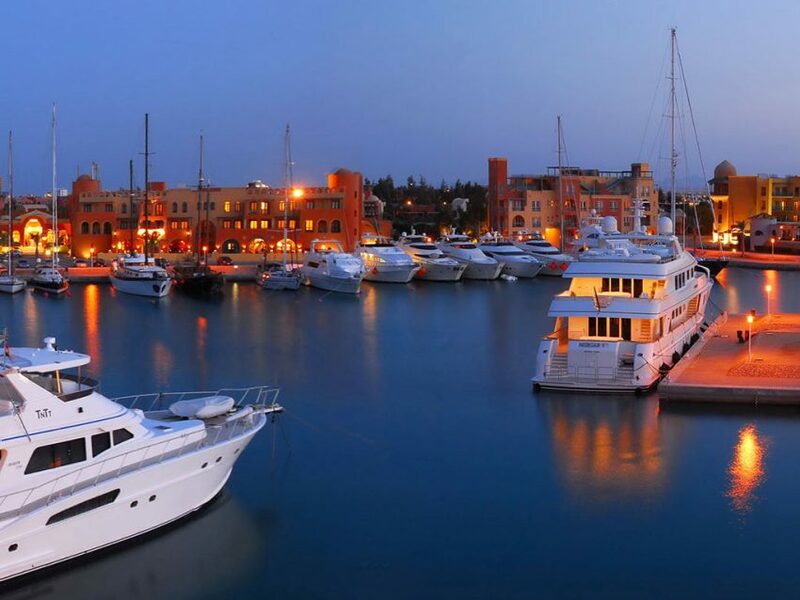 Boasting multiple marinas, comprehensive services, and an aesthetically unified harbor town designed by Italian architect Alfredo Freda, El Gouna has quickly become a favorite docking place for pleasure craft traversing the Red Sea. A designated International Point of Entry, Abu Tig is in a league of its own among Red Sea marinas both for the high standard of services it provides as well as for its matchless backdrop: a harbor town that is not only architecturally praiseworthy but also offers El Gouna’s most exclusive shopping and dining. Abu Tig Marina town is just part of the world class touristic resort – El Gouna, which in itself is now a well established resort development complete with its own infrastructure including; power stations, water treatment plants, many international hotel chains, golf course, airport, hospital, school, shops, etc. The marina town contains two 4 star hotels, three smaller hotels, restaurants, cafes, bars, shops, and the marina South and North basin (yacht harbour) and was the first of its kind in the Red Sea. A number of lodging options are also available in the marina, which houses hotels ranging from intimate inns to a four-star beach front establishment. It is a popular winter base, where sailors can make the most of a reasonable cost of living, and it is also a harbor of choice for the Med-Red, Vasco de Gama, and Blue Water international yacht rallies. Abydos, El Gouna’s second marina, has a capacity of 40 vessels and harbors El Gouna’s many diving boats. It offers dry dock and repair services with a ship lift for vessels up to 19 meters, and has a diesel fuel station, electricity lines, channel-6 VHF and a maintenance center. Port and harbor master forwarding.